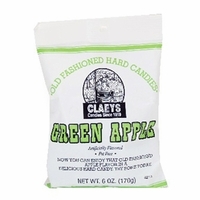 Claey's green apple candy drops are and old fashioned candy. A hard candy with a tart green apple flavor that is then coated with a fine sugar. This process makes them a sanded candy. Claey's green apple candy is fat free and made in the USA. You may May have heard of sanded hard candy drops, but are not sure what they are. Sanded is a process where hard candy is vacuum cooked then coated with a thin layer of extra fine sugar crystals. These hard drops come in a variety of flavors from sweet, sour , cinnamon and licorice by coating them with the sugar it also gives them a sweet flavor. Claeys old fashioned sanded candy is available in many flavors. Watermelon, wild cherry, natural horehound herb flavor, anise, licorice, sassafras and everyone's old time favor lemon drop. Although these are a favorite candy from the 50's first made in 1919, they are still very popular today.